I have been consulting with a lot of sales outfits lately and most of my evaluations have revealed that there is a huge need for sales coaching. Put bluntly not enough sales managers nor sales directors value “Developing Somebody” like they should. They are all looking for ready made sales people and guess what most of the good ones are set and aren’t looking to move. This has been a powerful observation. I didn’t set out to discover it. In fact I am disappointment at the reality of this statement. It has become obvious to me, as I meet even more teams, that developing superstars, making people better, isn’t something we prize. The idea that of all the things corporate leaders put on their resumes, on LinkedIn and brag about, developing powerful, productive, future leaders isn’t one of the things we value. And it’s sad, in fact its foolish. Developing superstars and helping people grow should be our number one priority, but it’s not. We spend far too much time managing people to goals and numbers, not growth and development. How often do you hear leaders talk about developing someone? How often do you hear leaders talk about their goals to improve the capabilities of their employees? How often have you heard an executive say their biggest accomplishment in their career was the impact they had on their people? Let’s stop and think about it for a moment. As leaders, our most important job is to develop and grow people. We can not be successful if our team is not successful. Leaders don’t do the work. Their job is to get the work done through other people. Yet we spend more time talking about the deals we closed (our team closed), the mergers we accomplished (actually our team accomplished), and the 8 quarter over quarter growth we’ve created (actually our team created). We take credit and pride in the accomplishments we achieve through our team and take little pride about the people we nurtured, developed and grew to help us deliver on our goals. Unfortunately, too many leaders prize the numbers first, forgetting that there are no numbers, without the people. As leaders, it’s time we start measuring our value not only in the numbers but also in the people. It’s time we start measuring leaders on the number of stars we produce. It’s time we start tracking leader approval ratings. Do people like working for this person? It’s time we start tracking someone’s growth and accomplishments to their leaders. It’s time we start making it cool and acceptable to brag about developing people. Leadership is a people job. It’s about time we start giving credit to those leaders in our organisations that motivate, encourage and develop the next generation of leaders, and superstars, not just their ability to hit next quarter’s numbers. The greatest accomplishment any leader can make is in their capacity to grow, and develop their people into exceptionally productive and valuable assets to themselves and the organisation. That’s what great leadership is about. Remember, there is no success without the people. Do you produce superstars? Do you cultivate next generation leaders? Good, that’s something you should brag about. So to help you do this – I have developed a tool to help evaluate the effectiveness of a sales team. I have been refining this for years and now believe it is in a form that can help any sales manager conduct an evaluation of their team. It is a precise tool comprising 12 key questions covering the key aspects of strategy, structure, people and process. What’s more if you use the tool to evaluate your sales team – I am happy to sit with you and help interpret the results and set a course of remedial action to help hone the effectiveness of your sales team. 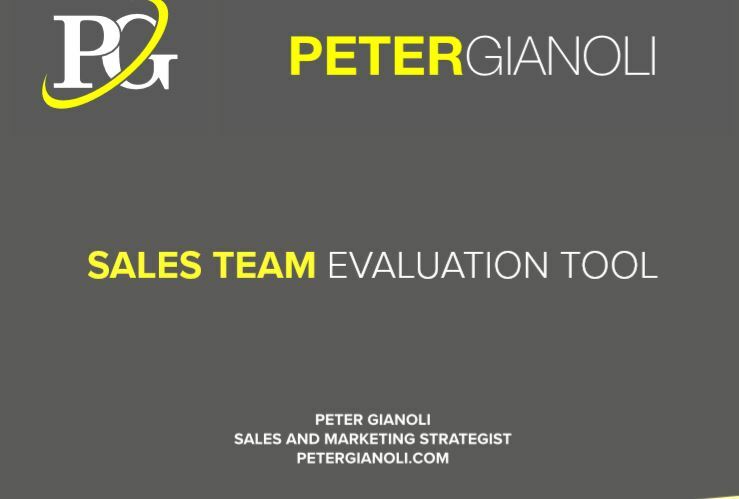 Download your sales evaluation tool here.